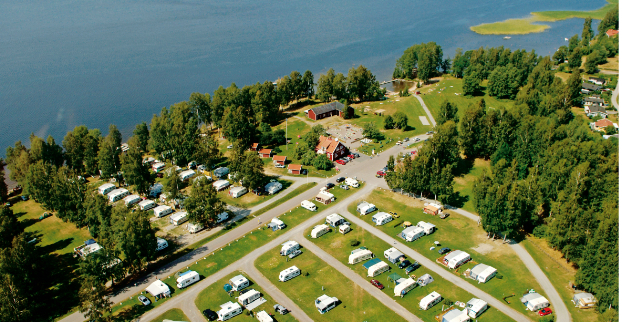 Frykenbadens Camping lies beautifully by Lake Fryken's eastern beach, 20 km from Karlstad. In an area ideally suited for taking a stroll or a jog. Here is an idea of what we offer: fishing, mini golf, billiard golf, playroom, playgrounds and a beach with jetties. In the area are an 18-hole golf course, go-cart rental and a motorcross track. Within 50 km are 7 18-hole golf courses. Outings: Mårbacka, "Travrike" a horseracing track, Rottneros Park etc. We have a restaurant and a convenience store with foreign newspappers and fresh bread every day. A warm welcome to Frykenbadens Camping!